There are sporting events held all over the countryside throughout the year. They vary from world-famous tournaments to local competitions, but what’s true for most of these events is that you’ll need a ticket to go and see them. These days it’s easier than ever before to get tickets for sporting events, but there are still some things to be aware of when buying. The easiest and simplest way to purchase tickets is through the internet. But even with this method there are many different options. The venues or sporting clubs themselves may sell tickets through their own websites, so it might be worth having a look there first. It's more usual, however, that they’ll direct online ticket sales to an authorised ticket sales website, such as Ticketmaster or Seetickets. Other online options for buying tickets include resale sites or private sales sites, such as eBay or Gumtree. These can be good for short-notice purchasing, when the original buyers find they cannot make the event after all. VIP tickets often go up on sites like eBay too, and it’s possible to get a bargain if you’re looking for hospitality but can’t afford the full price! If you support your local team, try visiting the box office to buy your tickets direct. For those who live some distance away from a venue, this might not be so easy. If you don’t want to buy your tickets online, ring the venue where the event is to be held and ask them what options there are for buying tickets. Hotly anticipated events, such as the Wimbledon Tennis Championships, can be very hard to get tickets for. This particular tournament has a public ballot for tickets applications and needs to be approached months in advance. If you’re planning on attending a world-famous sporting event, do research it as soon as you can, as getting highly sought-after tickets like these can be really tough. If you don’t mind lining up for highly attended events, it’s sometimes worth turning up on the day and just queuing for tickets. Venues will generally hold some tickets back for sale on the day, but again, each place is different. This is something else you can check when contacting the venue, to explore their ticket sales policies. Die-hard fans will often queue through the night to be in with a chance, so find out how long you might have to queue based on previous events. It might be that you need to take an overnight kit! Beware of touts outside the venue on the day of an event. 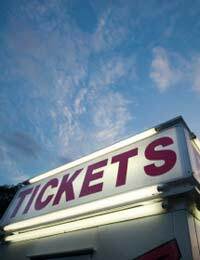 These sellers are unlicensed and will often be selling tickets at vastly inflated prices, and often the tickets are forged. Box offices will hold a wide range of tickets for sporting events, so if you have a box office in your local area, it’s worth popping in to investigate. If a box office is attached to a particular theatre or venue, the chances are they’ll still sell tickets for other events, so it’s definitely worth checking out. You can also call ticket hotlines and purchase tickets over the phone using a credit or debit card, so look out for advertisements which show these numbers. And again, visit the venue or event website for this information. The advantage of buying through an official ticket sales website, agent or box office is that you are offered some kind of protection for loss, cancellation or late arrival of tickets. Each outlet will have its own terms and conditions, so check these out when purchasing. You’re also guaranteed to receive genuine tickets rather than forgeries. Buying resold tickets through sites like eBay, however, runs the risk of the tickets being fake, or of them not turning up on time.